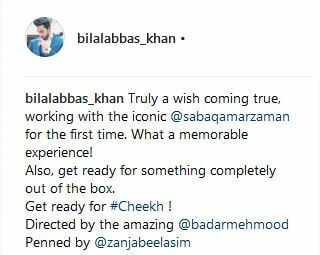 Starring the ever-gorgeous Saba Qamar and the heartthrob Bilal Abbas Khan, Big Bang Productions is coming up with yet another exciting project, Cheekh, that is expected to air soon! After Aisi Hai Tanhai, this is going to be Badar’s Mehmood second project as director with Fahad Mustafa and Dr. Ali Kazmi, the producers of Cheekh. 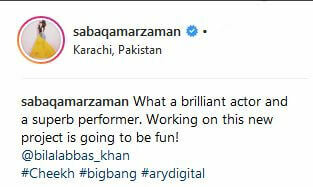 t is currently under the floors and will air on ARY Digital under the banners of Big Bang Productions. Previous articleSyra Shahroz Loses Her Cool After Internet Shames Her!